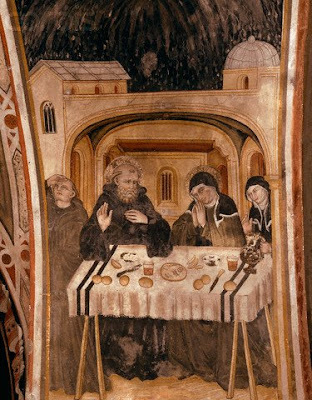 The final meeting between Ss Benedict and Scholastica, depicted in a 14th-century fresco in the Sacro Speco of Subiaco. At that time, the sky was so clear that no cloud was to be seen. 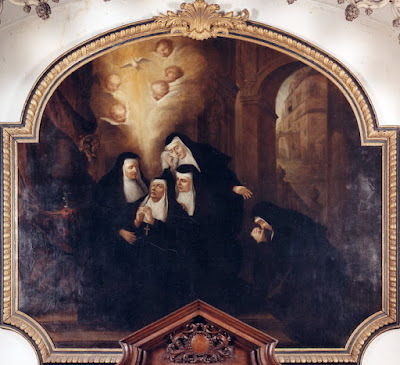 The holy nun, hearing this refusal of her brother, joined her hands together, laid them on the table, bowed her head on her hands, and prayed to almighty God. And when she lifted her head from the table, there fell suddenly such a tempest of lightning and thundering, and such abundance of rain, that neither venerable Benedict, nor his monks that were with him, could put their heads out of doors. The holy nun, having rested her head on her hands, poured forth such a flood of tears on the table, that she transformed the clear air to a watery sky. After the end of her devotions, that storm of rain followed; her prayer and the rain so met together, that as she lifted up her head from the table, the thunder began. So it was that in one and the very same instant that she lifted up her head, she brought down the rain. The man of God, seeing that he could not, in the midst of such thunder and lightning and great abundance of rain return to his Abbey, began to be heavy and to complain to his sister, saying: “God forgive you, what have you done?” She answered him, “I desired you to stay, and you would not hear me; I have desired it of our good Lord, and he has granted my petition. Therefore if you can now depart, in God’s name return to your monastery, and leave me here alone.” But the good father, not being able to leave, tarried there against his will where before he would not have stayed willingly. By that means, they watched all night and with spiritual and heavenly talk mutually comforted one another.